Take a free test-flight with a year’s membership of Butterfly Conservation this spring. Find out more about butterflies and moths and what you can do to protect them from habitat loss and climate change. This entry was posted in Expired on 20/03/2019 by admin. This entry was posted in Expired on 28/02/2019 by admin. Many members will have heard that HS2 is about to start clearing a huge area of approx 200 hectares on which the maintenance depot will be built if HS2 actually goes ahead. This is approx 500 acres, 2 square kilometres or 200 Twickenham Stadiums.The Calvert Jubilee Reserve will also be affected by clearance of an approx 75 metre strip along the eastern side for an access road, precisely the area with the best nesting habitat, and in which turtle dove and nightingale have been recorded in recent years. The plan by Fusion acting for Keir and HS2 is total clearance of all vegetation including mature trees, bushes and an estimated 19 kilometres of hedgerow. This is a prime area for all the hairstreaks too. What happens here is likely to set the pattern for the massive clearance that will be associated soon with the new Expressway in the Growth Arc across Oxfordshire, Bucks and Bedfordshire, with its plan for one million new houses. Please make your feelings known to the local MP john.bercow.mp@parliament.uk and the minister for HS2 nusrat.ghani.mp@parliament.uk and come to Calvert on 27 February. Calvert to Steeple Claydon: What is the plan? What area is being cleared? What are you doing to preserve natural features like trees and streams? Why are you planning to do this as the bird nesting season is starting? Where are you going to provide replacement areas in mitigation? Calvert Jubilee Reserve: is it just an access road up the east side of the existing railway? How wide? How long? Is it necessary when the main works are the other side of the railway? What happens after it is no longer needed? Why precisely as the nesting season starts – is this legal on a nature reserve? What are you doing to minimise damage to orchid rich turf, mature trees and scrub that are essential for butterflies and birds including nightingale and turtle dove? Has statutory public notice been given – where and when? Needless to say, BBOWT is taking steps but needs your support. The Trust is fortified by a favourable judgement yesterday in its fight to have the Expressway route revisited as the developers (the government) disregarded the law in making their decision. This entry was posted in Expired on 22/02/2019 by admin. College Lake Nature Reserve (Near Tring). Meet in reserve car park (£3 suggested donation) signed off B488 ¼ mile north of canal bridge, Bulbourne. SP 936 138. 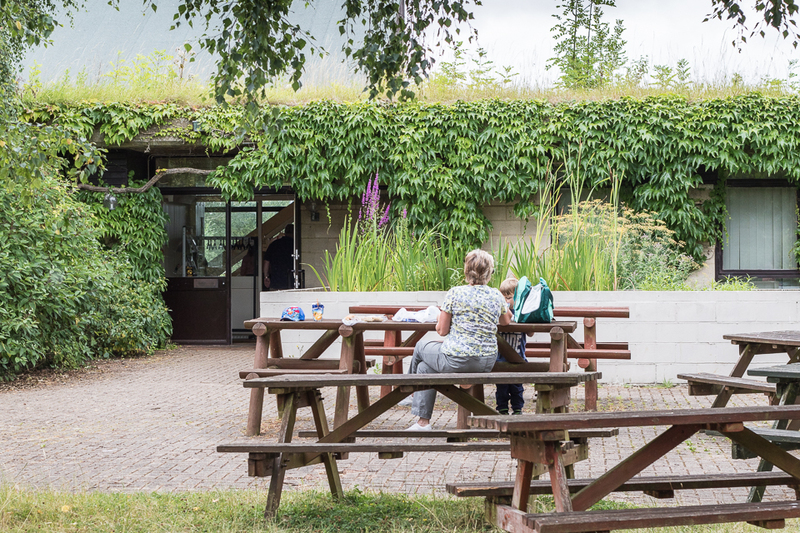 This flagship BBOWT reserve has a fine visitor centre, toilets and cafe. The flooded chalk pit always holds a good range of birds (we have recorded 50+ species on some of our previous visits). Paths mostly good, and Mobility Scooter can be booked ahead on 01442-826774. This entry was posted in Expired on 05/02/2019 by admin. Today is World Wetlands Day (02 February 2019), and a timely reminder of how paramount wetlands conservation is in our fight against climate change and the risk of natural disasters. Organised by the Ramsar Convention, a treaty bringing together 170 countries committed to conserving these precious habitats, World Wetlands Day is a chance to raise the public profile of this important habitat. This entry was posted in Expired on 03/02/2019 by admin. Some of you will remember Chris’ talk last season – Part 1 of this “mini-series”. Part 2 will bring you lots more on his memorable three month Australian trip. Highlights include whale watching in Queensland, Sydney and the Blue Mountains in New South Wales and a Northern territory adventure visiting Kakadu National Park and other locations near Darwin. Images of iconic mammals and birds, plus some spectacular landscapes as well. Great photographs and an entertaining evening. This entry was posted in Expired on 31/01/2019 by admin. This entry was posted in Expired on 27/01/2019 by admin. All entries must be handed to Martin or Lewis by the end of the January 15thmeeting. This entry was posted in Expired on 10/01/2019 by admin. Come and help tidy up the reserve and work off some of that excess Christmas food at the same time ! This entry was posted in Expired on 29/12/2018 by admin. This entry was posted in Expired on 27/11/2018 by admin. Open Sunday at Linford Lakes NR 18 November 2018 10:00-16:00hrs. The reserve is open to friends and family, bring the neighbours too. Buy a unique pre-Christmas gift and some bird-seed too. Also, Andy Harding, the County Bird Recorder, will be taking his monthly wildfowl count this morning. He is willing to take a group along to the hides and will help with identifying ducks and other birds. Please meet at 10:00 a.m. at the Centre. This entry was posted in Expired on 14/11/2018 by admin. 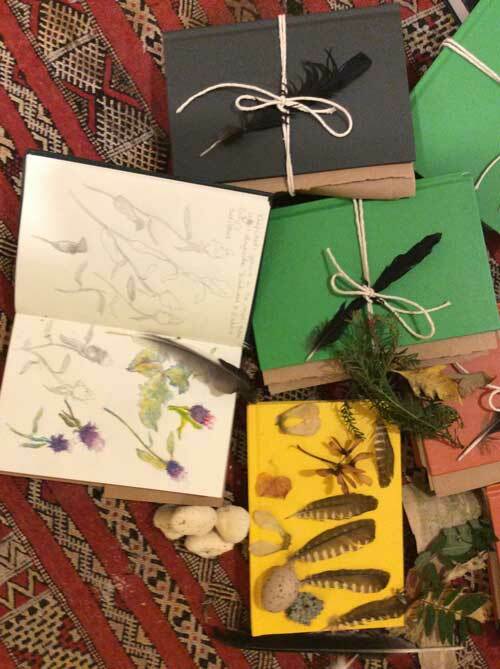 If you have any natural history books you no longer need that can be sold to raise funds for the MK Natural History Society, please bring them to Tuesday’s meeting (30th) as soon as you can after 7.30pm. We aim to sell them that evening. This entry was posted in Expired on 25/10/2018 by admin. Fee: £20 for BNHS & Bird Club members, £25 for non-members. This entry was posted in Expired on 07/10/2018 by admin. This is your last minute reminder for our visit to Ivinghoe Common (part of Ashridge) this coming weekend on Sunday September 23rd. Please be sure to check online for the correct parking/meet point as this is NOT the place on the road up to the monument where we may have met previously! This entry was posted in Expired on 21/09/2018 by admin. Due to the extremely dry period over the last few weeks and months in our area it has to be said that fungi-hunting at the moment is somewhat disappointing to say the least! I hope this won’t deter you from joining us but if you’re coming please don’t be surprised if finding beautiful specimens proves a bit of a challenge. We badly need a prolonged spell of rain in the Chilterns to get things moving. This entry was posted in Expired on 13/09/2018 by admin. This entry was posted in Expired on 04/09/2018 by admin. Batty about bats and mad on moths? Doors open at 19:15 hrs. Come and find out about the bats and moths here at Linford Lakes Nature Reserve. Event starts prompt at 19:30hrs. The evening will start with a presentation about bats followed by a walk with bat detectors and finishing with an insight on catching and identifying moths. Please note, no dogs allowed on site. This entry was posted in Expired on 30/08/2018 by admin. Come and help tidy up the reserve. Great way to keep fit, work with a friendly group of people. This entry was posted in Expired on 03/08/2018 by admin. I thought I should draw peoples attention to a wonderful lighting and sound installation called ‘For the Birds’ taking place this week at Linford Manor Park as part of the MK International Festival. It is a truly magical experience and great fun and for anyone who is interested in birds it would be a pity to miss out on it. Quite what the local wildlife makes of it is a different matter but it is well worth a visit. Tickets are £15 available from the Box office 01908 280800 and it is on in the evenings Wed 25th – Sat 28th July. You can find more information on The Parks Trust website. This entry was posted in Expired on 23/07/2018 by admin. This week’s meet took place at Rushden Lakes in Northamptonshire, a large reserve of lakes, woodland and flower meadows owned by The Wildlife Trusts. While this site is somewhat further afield from many of our previously-visited sites, like many of our more familiar parks and reserves in Milton Keynes, it is a mere stone’s throw away from a large retail park which continues to grow day by day. Such a busy urban setting might put a casual wildlife enthusiast off from the area but as we gathered from our visit, this is an incredibly rich and diverse area in terms of both habitats and species. As usual for our outdoor meetings, our walk began around 7pm, led this time by Reserve Ranger Toni Castello and three of his volunteers from The Wildlife Trusts. For much of the day, the weather was dull and overcast but fortunately as we made our way there, the low-level cloud cleared, bringing warm sunshine and a mostly clear sky for the rest of the evening, ideal for finding basking insects and bird-watching. After a brief introduction to the site, its history and its management, our walk began, passing by two of the lakes, the Nene Valley River and into two of the meadows. While the breeze on the surface of the lakes prevented us from seeing the clouds of damselflies Toni and his volunteers claimed to see frequently there, we found no shortage of them basking along the waterside vegetation, two of the most numerous being the Red-eyed Damselfly and the stunning Banded Demoiselle. Male Banded Demoiselles were frequently popping up from the nettles and bushes as we walked by, with a few females and a mating pair among them also. While we were stopped next to one of the lakes, we also spotted many freshly-emerged damselflies with their exuvia in the reed-beds including Common Blue and Azure Damselflies. Much of the discussion from Toni and the volunteers went into the making and management of various parts of the reserve, including the man-made lakes, one of which was said to be far more productive and beneficial for wildlife having been dug to various depths, rather than a mere large hole in the ground filled with water. “The large meadows we saw had never been ploughed and there were cattle grazing. There are two meadows, both categorised as MG4 (Lowland Meadow), the western one drier, and the eastern one wetter. The western meadow had a range of tall grasses, and Great Burnet (Sanguisorba officinalis) in flower, and earlier in the year the Cuckoo flower, Ladies bedstraw, Birds foot Trefoil, and Meadow Vetchling would be showing. While the densely covered trees and hedgerows prevented us from seeing many of them, it was a great evening for birdsong and observing several species around the lakes. Several Black-headed Gulls were seen over the lakes, with Cormorants and Grey Herons passing over. Just before the walk began, a distant Cuckoo was heard from the circular walk and warblers were singing constantly through the evening, including 5 Garden Warblers, Reed Warblers, Willow Warblers as well as 3 Song Thrushes. This year’s unprecedented lack of hirundines was unfortunately apparent here also but a group of at least 10 Swifts could be seen over the lakes. This trip was a satisfying and educational end to what started off as an otherwise dull day, at a site that I’m sure many of us will visit again in the future to find out more. It is apparently a notable site for waterfowl in the winter, so a recommendation for local bird-watchers for sure. This entry was posted in Expired on 18/06/2018 by admin. Please note the additional details Peter Meadows has provided about this walk. This entry was posted in Expired on 04/06/2018 by admin. April 2018 edition of the Magpie published. The latest issue of our society newsletter ‘The Magpie’ can be viewed in the Publications section of the website or by clicking here. This entry was posted in Expired on 10/05/2018 by admin. The summer programme of walks has been added to the programme page. It looks like a great series of interesting and varied outings. This entry was posted in Expired on 13/04/2018 by admin. Open Sunday at Linford Lakes NR 15 April 2018 10:00-16:00hrs. Great views through the new windows. Here’s hoping for some warmer dryer weather as this can be a busy time on the reserve with lots of new arrivals. Birds singing and nest building, bees a buzzin, crickets chirping and butterflies and flowers too. Come and enjoy the reserve a new, now we are free of any current building plans to spoil our enjoyment. This entry was posted in Expired on 02/04/2018 by admin. This entry was posted in Expired on 17/03/2018 by admin. Special Anniversary Event: Join us to celebrate 50 years of MKNHS! Bardsey Island, Llyn Peninsular, Gwynedd, North Wales..
2018 marks the 50th anniversary of the founding of Milton Keynes Natural History Society. Patrick Barkham is a well-known natural history author and writer for The Guardian. His books include “The Butterfly Isles” and “Badgerlands”. Recently he has published “Islander: a journey around our archipelago”, an exploration of eleven of the smaller islands of Britain which will be the focus for his talk. Do join us for this special evening! This entry was posted in Expired on 08/03/2018 by admin. 3 March 2018 update – the walk is NOT CANCELLED but please take extra care if travelling by road. This entry was posted in Expired on 03/03/2018 by admin. Please note that the minutes of the 2017 AGM were printed in the April 2017 Magpie. The meeting will also consider the options for income raising presented by the treasurer Joe Clinch in the December 2017 Magpie. This entry was posted in Expired on 27/02/2018 by admin. This evenings talk on Kenya and Tanzania is still going ahead. We have checked the car park at Bradwell Abbey and it is ok but please take extra care as, if conditions worsen, it might be icy. Open Sunday at Linford Lakes NR 18 February2018 10:00-16:00hrs. Rick Simpson will be at LLNR on Sunday 18th Feb.
Rick and Elis Simpson run a charity, Wader Quest, to help conserve waders around the world. Raffle tickets for a unique oil painting. The draw for the winner is to take place at the end of April. This entry was posted in Expired on 04/02/2018 by admin. An opportunity to get fit, keep warm, make friends and help the reserve. Path clearing, litter picking and general tidying up around the reserve. All welcome, children to be supervised by a responsible adult. This entry was posted in Expired on 31/01/2018 by admin. Meet up for a chat and help your favourite reserve too. This entry was posted in Expired on 04/01/2018 by admin. Please remember to submit your local sightings to sightings@mknhs.org.uk and to look at the Recent Sightings in the News section. There are some fabulous pictures of otters in a member’s garden. This entry was posted in Expired on 24/12/2017 by admin. In view of the cancelled Open Sunday last week-end due to the adverse weather conditions it has been decided to hold a modified Open Sunday this coming Sunday (17th Dec). Andy Harding will be conducting his monthly duck count in the morning of 17th. Andy is willing to take interested visitors with him to the hide and assist with bird identification. Please join Andy at the Centre for 10:30am. This can be a great time of year for spotting some of our winter visitors, who can turn up in good numbers to rest up and feed. The Open Sunday will conclude at 3pm on this day, due to the short daylight hours at this time of year. The Centre will be open for hot drinks and homemade cakes. Xmas crafts and Calendars on sale for those last minute gifts. Get your bargain holiday read from our second-hand books on sale. Please note there will be NO CHRISTMAS WREATH MAKING TODAY. The Public Inquiry relating to the development at Linford Lakes is on-going. The Investigator has adjourned the Inquiry which will meet again on 26th Jan and if required again on 2nd Feb. Decision 4-5 weeks after that. This entry was posted in Expired on 14/12/2017 by admin. Due to adverse weather conditions and the treacherous state of the Cruck Barn car park on 12 December 2017, the MKNHS Christmas Party has been rescheduled to Tuesday 19th December 2017. This entry was posted in Expired on 12/12/2017 by admin. All other animals, including mammals, fish, insects etc. People must not be a major subject of any photograph. Pictures must be handed to Julie Lane, Linda Murphy or Jean Cooke by the end of the 16 January 2018 meeting. Hoverflies by Mark Strutton at the top of the page. May the best photograph win! It could be yours! This entry was posted in Expired on 05/12/2017 by admin. Christmas Decorations, using natural materials. The Christmas Craft Sessions cost £10.00 each, £15 for family. Andy Harding may be recording his duck count this morning. He is willing to take a group along. Please meet at 10:00 in the centre. You can enjoy a walk and spend time in the hides watching our winter wild fowl and other seasonal visitors. Crafts, Gifts, Second-hand book stall, bird seed for sale and warming refreshments including mince pies and home-made cakes. This entry was posted in Expired on 03/12/2017 by admin. Come and enjoy some activities on a crisp winter’s day. Good company, good craic and doing some good for the reserve. This entry was posted in Expired on 01/12/2017 by admin. Sunday 26th November 2017 saw the first of our Society winter walks. 15 hardy souls braved the icy winds at North Willen Lake and were well rewarded. We met at the Willen Pavilion car park on the west shore of the lake and began by looking at the veteran ash tree near the lake edge. Martin Kincaid explained how The Parks Trust has managed the decline of this tree and the recent discovery of bats roosting in it. We then walked clockwise around the lake, stopping at times to look at the many species of duck among the huge group of coots (cootarium!) on the water. A single female Scaup, among a group of Tufted Ducks, was probably the pick, with good numbers of Teal, Mallard, Wigeon and Gadwall also spotted. We also found some nice specimens of the fungus Clitocybe geotropa on the grassy banks. When we reached the Flood Control structure, Mark Strutton shared his experiences of seeing otters here on several occasions in 2016. The animals are still active here and we were able to pick out a track from the lake edge, across the redway and down to the River Ouzel where we also found several piles of otter spraint and a slide down into the river! At the bridge between the north and south lakes, we added 4 Little Grebes to the list and a Kingfisher was spotted shooting low across the water. We also admired a very tame Little Egret roosting in willow at this point. Ann Strutton managed to spot a group of 6 Goldeneye bobbing about on the South Lake at this point, and we did our best to see them between their frequent dives. On the approach to the bird hide we spotted a Chiffchaff (there seem to be more than ever around this autumn) and hazel catkins. Form the hide itself we added Pochard and Shoveler to the wildfowl list bringing our duck total to nine species. However, waders were thin on the ground with just a single Lapwing observed. A single Greylag was the only goose we saw – obviously there were easier pickings on the South Lake. The main target for today’s walk was the starling murmuration and we quickly marched around towards the Peace Pagoda to take position and wait. The first group of about 50 starlings appeared right on queue at 3.50pm and within five minutes they were swarming over the lake. 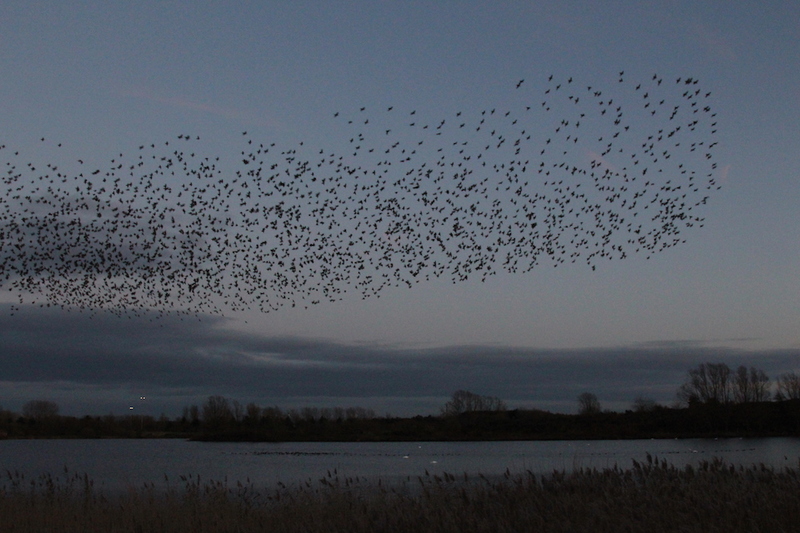 Although there were probably no more than 2,000 birds (a pretty modest number) they put on a fine display as the sun set and for those who had not witnessed a starling murmuration before it was a memorable experience. A singing Cetti’s Warbler was a bonus at this point. The starlings finally settled in the reed beds at around 4.15pm at which point we said our goodbyes and retired for the evening, happy but in need of thawing out! This entry was posted in Expired on 28/11/2017 by admin. This project was part of the ‘Clean Water for wildlife survey’ run by the Freshwater Habitats trust’s “people Ponds and Water Project”. The test results showed that the water quality around MK is generally pretty good, with low levels of both Nitrates and Phosphates. Phil researched the net to try and establish an ‘acceptable’ level for nitrates for ‘environmental Water’ and the International Consensus is less than 5ppm. So how did our 5 sites compare? * indicates the higher level of Nitrates. This brook runs through farmland, which might account for it. These figures need to be taken with a pinch of salt as the colour of the water in the test kit was assessed against the colour on the recording chart. This entry was posted in Expired on 23/11/2017 by admin. Starlings – love them or hate them? The common starling (Sturnus vulgaris) is one of the most invasive bird pests worldwide, having established populations in many countries outside its natural range. You can read more of the Australian Government’s warning here. In England, Starlings are protected under the Wildlife and Countryside Act 1981, which makes it illegal to intentionally kill, injure or take a starling, or to take, damage or destroy an active nest or its contents. The Starling is on the Red List of Birds of Conservation Concern. I will let you draw your own conclusions. This entry was posted in Expired on 06/11/2017 by admin. This entry was posted in Expired on 04/11/2017 by admin. We’re very pleased to welcome David Lindo back for a return visit to our Group – since he last visited us, David has been as busy as ever, writing, broadcasting on TV and radio, leading bird tours … and travelling far and wide. David has visited over 270 cities worldwide in search of urban birds. During his travels he has found a surprising number of committed conservationists, interesting birding locations and, importantly, many birds. Join him on his journey in and around some of the world’s best urban birding areas. Sure to be an entertaining and informative evening. This entry was posted in Expired on 02/11/2017 by admin. The originally planned presentation by Caring for God’s Acre, has been rescheduled to April 2018. We are now delighted to announce that Jeff Blincow is now coming to tell us about “Conservation Projects at Yardley Chase”. This is a completely new talk he has not yet given elsewhere. This entry was posted in Expired on 31/10/2017 by admin. The exhibition is at All Saints, Lathbury, North Bucks on 11th and 12th November 2017 from 10-5pm. This entry was posted in Expired on 29/10/2017 by admin. This entry was posted in Expired, Society News on 11/10/2017 by admin.